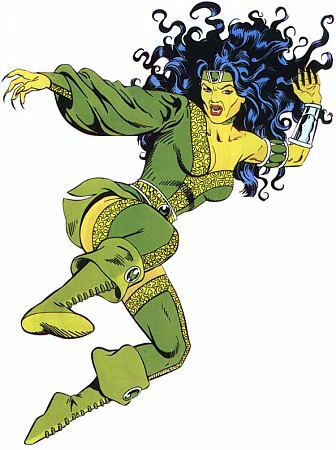 Cheshire is an absolutely lethal hand-to-hand fighter, an expert in martial arts almost in the class of Lady Shiva. She is also a triple jointed acrobat and a master of poisons. Nails Cheshire has razor sharp finger nails that she coats with poisons and uses as a weapon. Weapons: Cheshire usually carries a number of weapons and often carries a sword. Born allegedly, to a French father and a Vietnamese mother, she had an unhappy childhood and was sold into slavery. The trauma of this made her psychotic, and paved her way into becoming one of the world's most ruthless mercenaries. After killing her master, Jade was informally adopted by Chinese freedom fighter Weng Chan, who taught her all he knew about guerrilla fighting. She acquired a knowledge of poisons from Kruen Musenda, a famed African assassin known as the "Spitting Cobra" and to whom she married when she was just 16. Following Mussenda’s death, Jade became the successful hired killer Cheshire.